Leading Rails developer teaches Rails 3 by guiding you through the development of your own complete sample application using the latest techniques in Rails web development. Hartl explains how each new technique solves a real-world problem, and he demonstrates this with bite-sized code that’s simple enough to understand, yet novel enough to be useful. 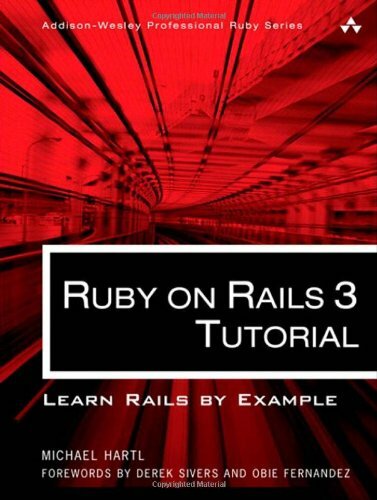 Covers the Ruby language from the very basics to the advanced topics. Written in a conversational narrative rather than like a dry reference book, Mr. Neighborly's Humble Little Ruby Book is an easy to read, easy to follow guide to all things Ruby. In order to prevent attacks, minimize their impact and remove points of attack, first of all, we have to fully understand the attack methods in order to find the correct countermeasures. That is what this security guide aims at. A book designed around teaching Ruby on Rails in a precept upon precept fashion. Both theory and practice driving your knowledge. If you are a beginner, the purpose of this book is to simply get you there in small, manageable steps. Introduction to Ruby, an object-oriented programming language, which allows for programming without extra syntax or code. Shows how to easily mine the Ruby language, teaching the basics, plus how to write large programs, and more.